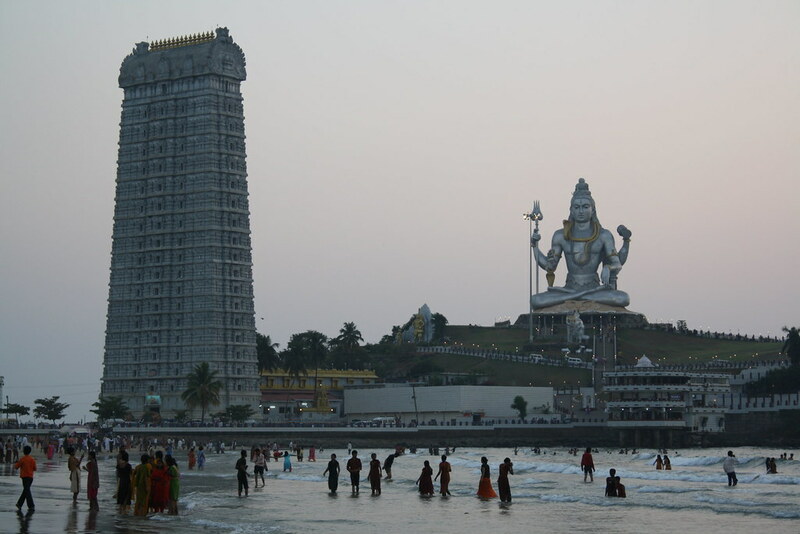 The pic of Murdeshwar (Bhatkal, Karnataka) below should give a clear idea of the idol size. Bholey is called Bholey because he is a naive unsophisticated type. He is not 'andar kuch bahar kuch' type. He does not understand or interest himself in 'behind the scenes' details. He takes things at face value. This nature of Bholey has been taken advantage of by many a smartypants. The Bhasmasur story is one of the popular ones. if you have little time to type it or ctrlC ctrlV then enlighten us. i will post it in some time. no googling or ctrl-c ctrl-v. i will type what i know in my own words. Bhasmasur was a demon who was a ardent Shiv bhakt. He did penance and meditated [tapasya] to make Mahadev happy. Bholey was happy and asked him what he wishes. He asked for immortality which Bholey refused. He then asked for a vardaan that who-so-ever's head he places his hand on, turns into ash [bhasm]. Mahadev granted him the wish. Bhasmasur then immediately tried to place his hand on Mahadev's head. Bholey had to run to save himself. Why did Bholey run? To save himself? Or to save the entire creation? He is not just responsible for himself but the creation too. So he must save himself. Vishnu came to the rescue. He took the avatar of a beauiful woman called Mohini. Bhasmasur saw Mohini and was totally lattu over her [who wouldnt have?]. Mohini asked him to dance with her matching her steps. He gladly agreed. After dancing for considerable time, as one of the dance postures, Mohini placed her hand on her head. Bhasmasur did the same. And his own granted wish came true on himself. Mahadev was saved and so was Trilok. Everyone should now know why dance and music are considered haraam. They make one lose the focus of the target. I will too ... but need to spread first. The holy ganges emanates from the head of Gangadhar. If you visit Vaisho Devi, there is a spot 'shiv-ganga' which you shouldn't miss. It takes juts 10 to 15 minutes to visit just after you come out from Mata's darshan. And imagine, you get to glance and experience things which are supposed to be 'stories'. thoda detail mein batao please. sorry private mein bol dena. Can you or someone explain the story/legend behind the Shiv ling? Is it really what it is said to be? And why are women supposed to pour milk over it? Not milk .. you're just supposed to keep it wet. Water will do. Milk is more auspicious. Much less gross than PJ, anyway.